Explore locations where the Empire’s laws and influence are dimmed or muted. Meet shady characters, independent thinkers, and insurgents looking to break free of Imperial law. In an Edge of the Empire campaign, bounty hunters, smugglers, mercenaries, and explorers may find themselves working alongside doctors, politicians, and scholars. 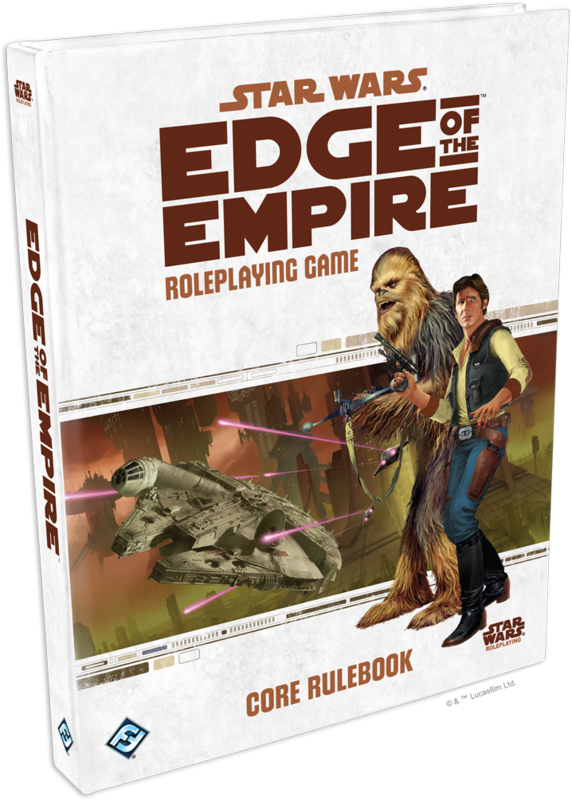 Edge of the Empire pairs custom dice with its skill-based rules system to ensure that every action is loaded with drama, possibility, and narrative impact. All characters in Edge of the Empire begin with an Obligation that compels them forward. You may owe thousands of credits to a Hutt, or you may have a bounty on your head. Perhaps, you’re still trying to kick a nagging stim addiction. You may even be bound by a sense of duty, looking for every opportunity to aid the Rebels who saved your family from a Stormtrooper brigade. 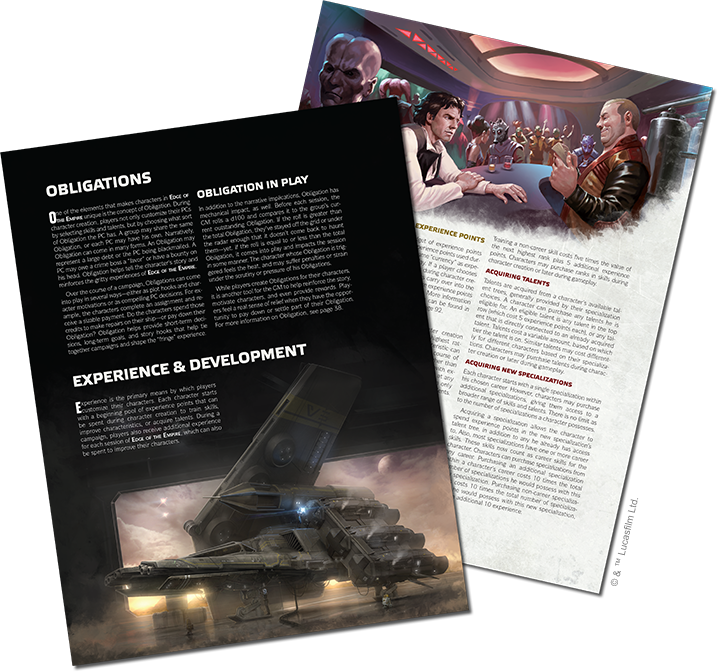 Edge of the Empire uses a unique Obligation mechanic to hook you into its stories and to define the smugglers, scoundrels, outlaws, and other souls willing to assume the risks inherent with adventures in the galaxy’s most shadowy locations. Throughout your campaigns, you can work to fulfill your Obligation, or you can take on new Obligations. But beware, in Edge of the Empire, everyone’s got a past, and characters’ pasts have a way of catching up with them! 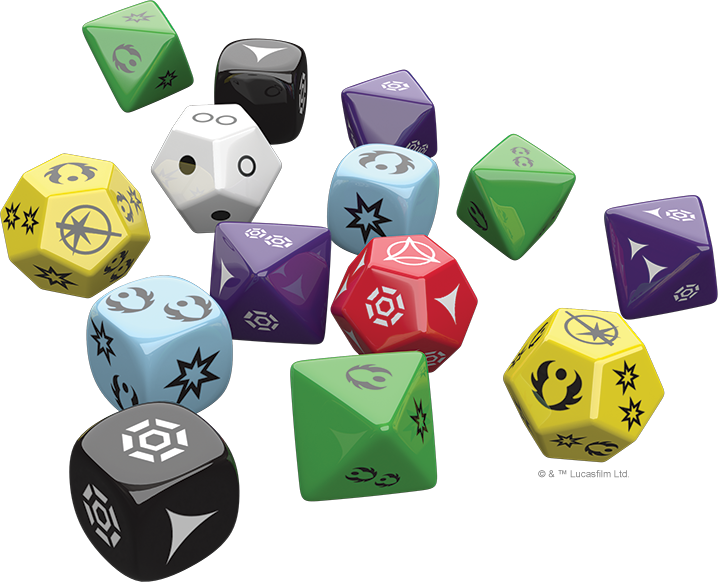 The core mechanic of Edge of the Empire is the skill check, which utilizes a pool of custom dice. No matter what task you undertake, you’ll roll a pool of “positive” and “negative” dice and compare their results. If your successes outnumber your failures, your character succeeds, but even successes may be loaded with myriad dramatic possibilities. Edge of the Empire adds to the narrative impact of your skill checks with the addition of “advantage” and “threat” results. Your character may successfully repair the transfer circuits in his ship just in time for a dramatic jump to light-speed only to come out of hyperspace in the middle of an asteroid field. He may take a wrong turn into a dead-end alley while trying to outrun a pair of Gamorrean mercenaries but discover that the Gamorrean’s are susceptible to bribes. No matter the situation, your skill checks do more than just resolve a single action; they help drive the story forward! Experience the thrills and adventures of life on the outskirts and the fringes of the Star Wars galaxy.